The Helios beach shelter, with its extremely small pack size and light weight is the epitome of mobility and provides deluxe sun protection with UV60! Recently, beach shelters have become increasingly popular. There are a number of reasons for this. First of all, conventional sun umbrellas can be replaced with beach shelters and can be set up quickly and easily at and away from the beach at any point. At this point we would like to present the Helios beach shelter, which has many advantages. Helios beach shelter – features at a glance! 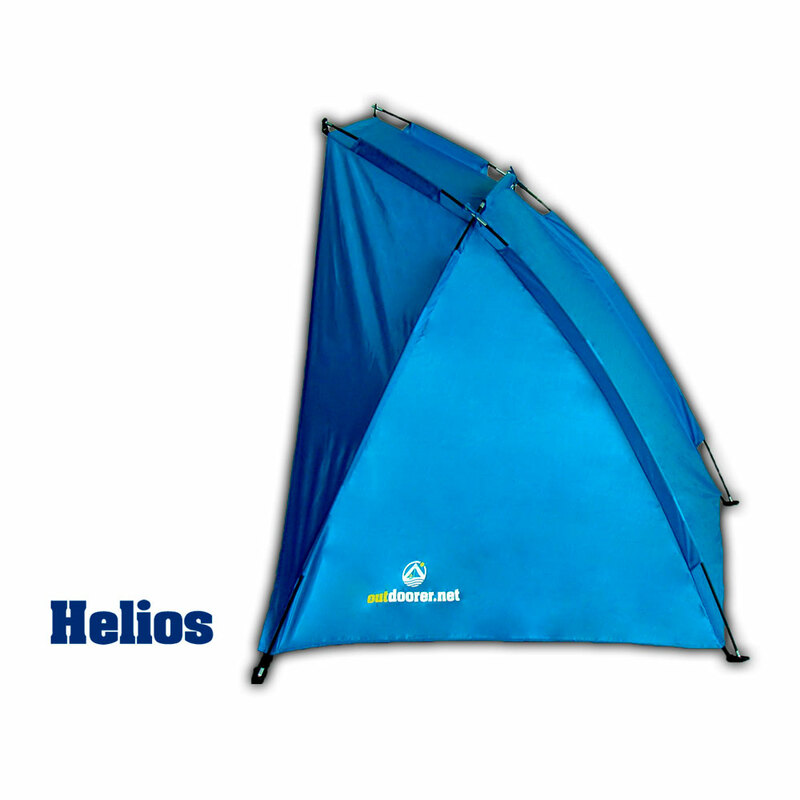 Order the Helios beach shelter via Amazon! For whom is the Helios beach shelter useful? The Helios beach shelter is suitable for everyone who wants to enjoy some quality time on the beach either by themselves or with a companion and be well protected from sun, wind and dust, without being restricted in their freedom of movement. At just 850g and with a tiny pack footprint you will be well equipped. What makes the Helios beach shelter different from other beach shelters? Optimal sun and UV protection thanks to its high-quality coating. 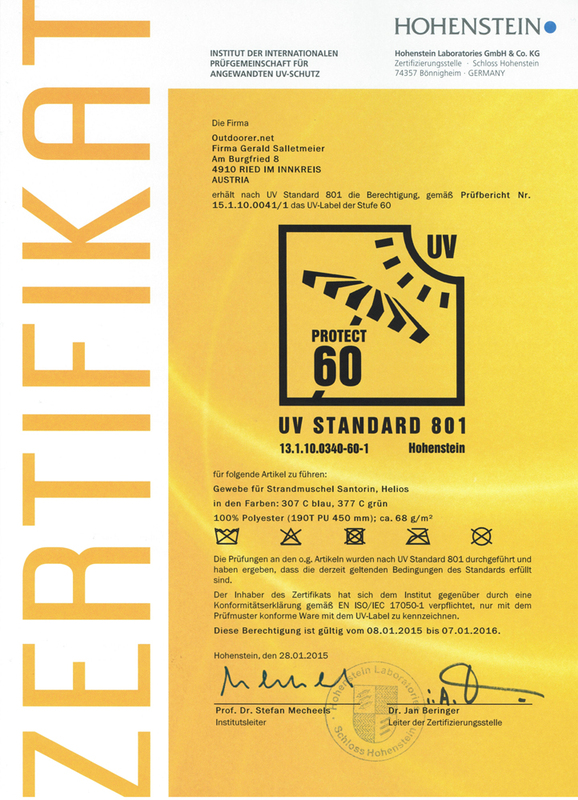 It offers SPF60 according to Standard 801. 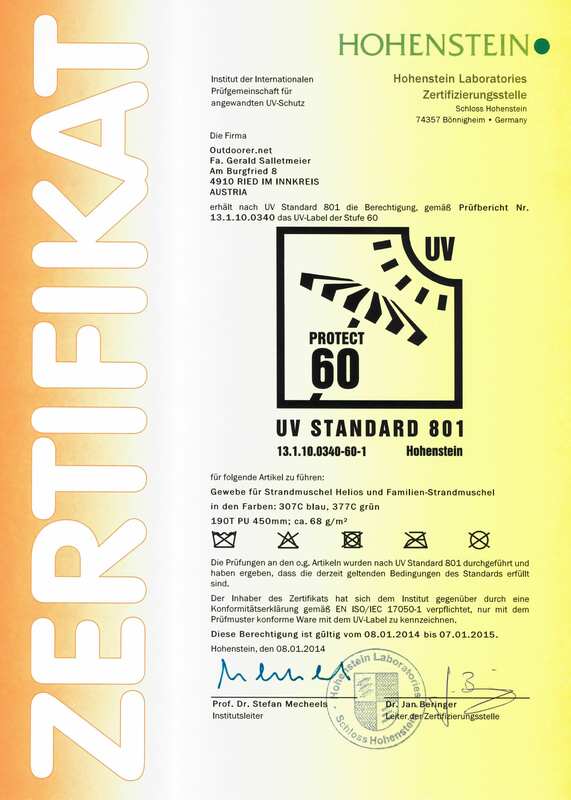 According to this measure, the UV protection factor is not tested in new condition, but after use. Pegs ensure a secure grip. This means that your belongings are protected from wind and thus wind-born sand. A small pack-footprint, which means the Helios shelter can be easily taken on a beach holiday, a day out at the beach or a walk on the beach and thus allows for greater freedom of movement. 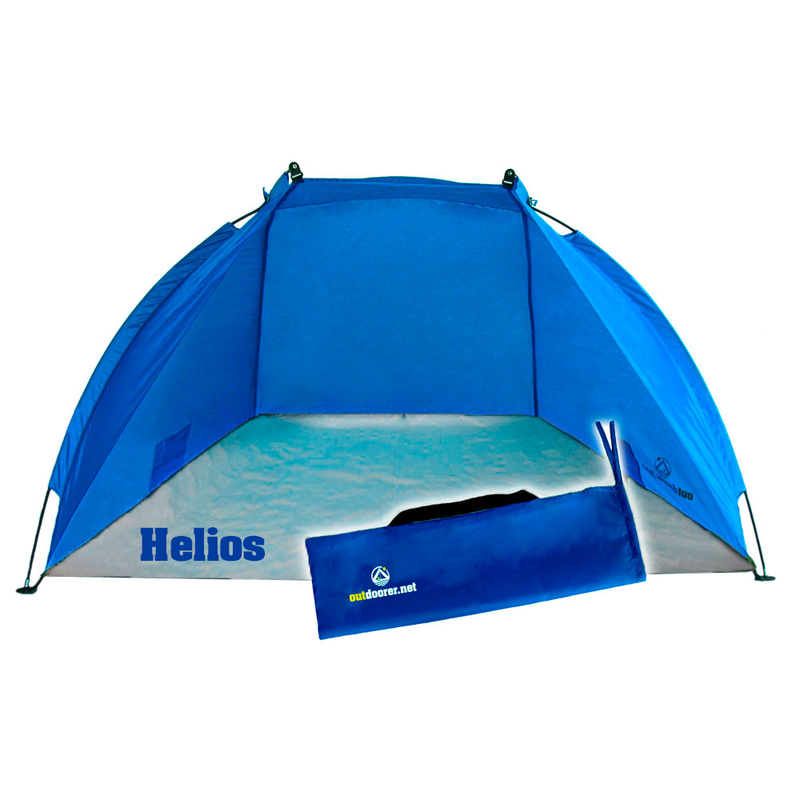 The Helios beach shelter is easy to pack away in the small carrying bag even after use! The size of the beach shelter is 170 x 100 x 100 cm and it is ideal for one or two people. Even when there is a sudden rain shower your belongings are protected in the beach shelter. Rugged and durable material: the top layer is made of 100-percent polyester, the base in 100-percent PE and the poles are made of fiberglass. The strong base provides more comfort even on very coarse-grained beaches and guarantees the longevity of your beach shelter. There are two inside pockets for storing small necessities. The inner pockets of your beach shelter will keep everything dry and free of sand and dust. The Helios beach shelter comes with the necessary pegs and a correspondingly handy carrying bag made of durable and water-resist permanent tent material. For very fine sand, we recommend special sand pegs. It is very quick and easy to set up and take down the Helios beach shelter. A manual is included! One of the main advantages of the Helios beach shelter is that it offers excellent value for money! 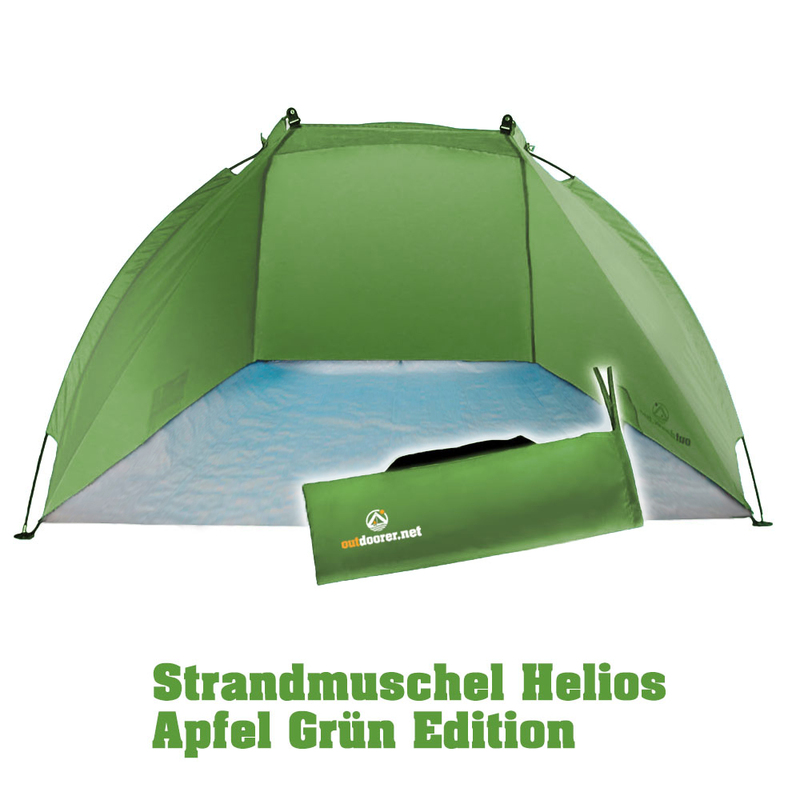 Where can you buy the Helios beach shelter? The beach shelter Helios is available at low cost and with quick delivery from Amazon. Create your own personal experiences with the Helios beach shelter and share them with us. We always welcome to your opinions and reviews.